Merced, CA: On Friday, March 4th, the Legends & Heroes and its’ newly designed moto-museum hit the shores of Daytona Beach and the Daytona International speedway for bike week. 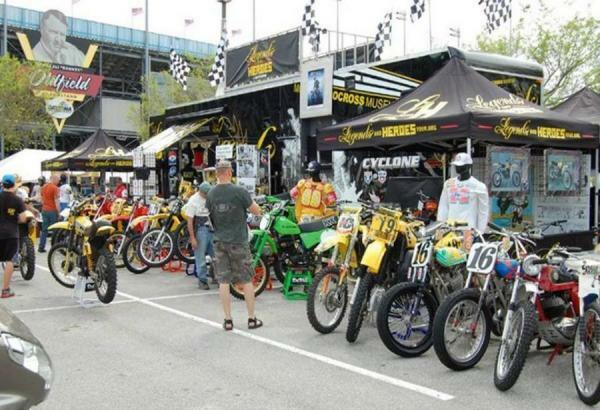 With the help of Florida’s VMX and AHRMA volunteers, one of the largest vintage display of historic motocross bikes were on hand to help celebrate the 40th anniversary of the Daytona Cross. 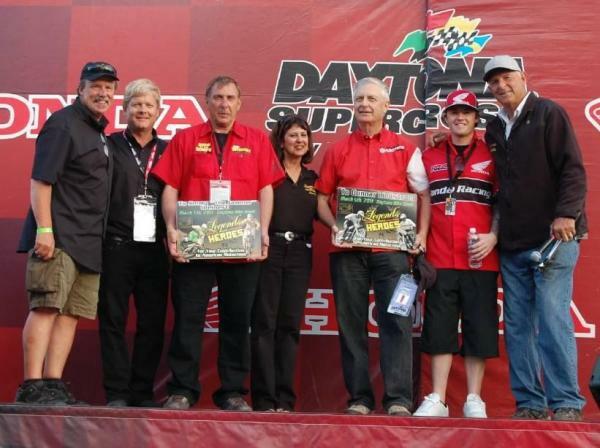 Honored Legends Gunnar Lindstrom and Jimmy “The Jammer” Weinert were on hand, as was “The Professor “Gary Bailey, who all enjoyed the celebration and the opportunity to tell the next generation about their racing careers. The Legends & Heroes Motocross Tour is a professional historical display and time-line of Americas greatest motorsport. The tour includes the machines and the champs of Motocross. The project was conceived by a dedicated group of Motocross Enthusiasts who, over the years, have discovered the value of the rich 40+ years of Motocross legacy and its impact on the American motorsports history. “The dedication and passion of the sport has brought the Legends & Heroes Motocross Tour to the next level of sharing this legacy, the history of the machines and men, as well as the women of Motocross. The history of the Classic Iron and its' champions is a dynamic model ever changing. We see this rich history as a great learning lab for all ages” according to Alex Moroz the tours managing partner.